One of the men lying [by the pool of Bethesda] had been sick for thirty-eight years. 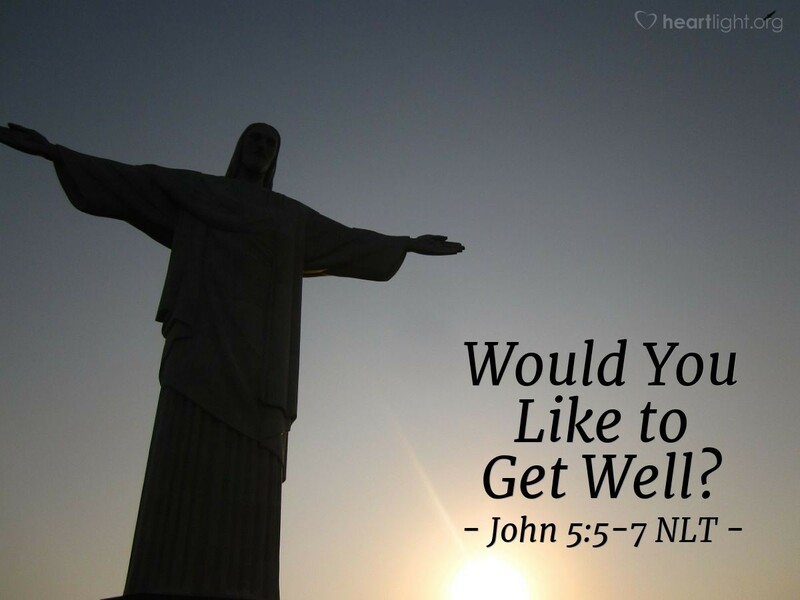 When Jesus saw him and knew he had been ill for a long time, he asked him, "Would you like to get well?" "I can't, sir," the sick man said, "for I have no one to put me into the pool when the water bubbles up. Someone else always gets there ahead of me." "Would you like to get well?" Sometimes our biggest disease isn't what appears in our bodies. Instead, this disease hides in our hearts. "Would you like to get well?" That's a much harder question to answer than meets the eye — when applied to my spiritual wellbeing. I might have to change. I might have to give up my excuses. I might have to adapt to a different lifestyle. I might have to give up blaming others for my problems. I might have to take some responsibility for my own condition. Jesus asked the question because, in this case, the man had a real disease. As the man shows by the end of the story, he wasn't ready to take responsibility for anything. What about us? Do we really want to get well, both spiritually and physically? Really? Then come to Christ and be ready for the Holy Spirit to begin changing you! Father, I do want to be made well. I want to be saved and conformed to you through and through — body, soul, mind, and spirit. I offer myself up to you to be changed so that I can be whole. I offer myself to be transformed to be more like Jesus, in whose name I pray. Amen.